For the equivalent award given to the best women's football player, see Ballon d'Or Féminin. Stanley Matthews of Blackpool was the inaugural winner of the Ballon d'Or. Prior to 1995, the award was often known in English language media as the European Footballer of the Year award. 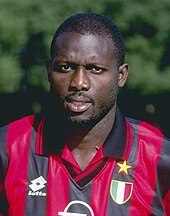 Milan's George Weah, the only African recipient, became the first non-European to win the award in the year that rules of eligibility were changed. Ronaldo of Internazionale became the first South American winner two years later. 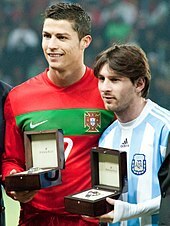 Lionel Messi and Cristiano Ronaldo have won the award a record five times each. Three players have won the award three times each: Johan Cruyff of Ajax and Barcelona, Michel Platini of Juventus and Marco van Basten of Milan. With seven awards each, Dutch, German and Portuguese players won the most Ballons d'Or. Only Germany (1972) and the Netherlands (1988) took all three top spots in one year. Two Spanish clubs Barcelona and Real Madrid share the top for employing the most winners, with eleven wins each. Between 2010 and 2015 inclusive, the award was merged with a similar one, the FIFA World Player of the Year award, to create the FIFA Ballon d'Or, which was awarded to the world's best male player before FIFA and France Football broke the merging agreement. After 2011, UEFA created the UEFA Best Player in Europe Award to maintain the format of the original Ballon d'Or. Eight players (Bobby Charlton, Franz Beckenbauer, Gerd Müller, Paolo Rossi, Zinedine Zidane, Rivaldo, Ronaldinho and Kaká) have won the FIFA World Cup, the European Cup/UEFA Champions League and the Ballon d'Or during their careers. One-time winners are only included if they have also finished second or third in another year. An honorary award, under the name Super Ballon d'Or, was awarded to Alfredo Di Stéfano in 1989, after he surpassed Johan Cruyff and Michel Platini in France Football's voting. A decade later, France Football elected Pelé the Football Player of the Century after consulting their former Ballon d'Or recipients. Among the 34 previous winners, 30 cast their votes; Stanley Matthews, Omar Sívori and George Best abstained, and Lev Yashin had died. Each voter was allotted five votes worth up to five points; however, Di Stéfano only chose a first place, Platini a first and second place, and George Weah two players for fifth place. Pelé was named the greatest by 17 voters, receiving almost double the number of points earned by the runner-up, Diego Maradona. To coincide with the 60th anniversary of the Ballon d'Or in 2016, France Football published a reevaluation of the awards presented before 1995, when only European players were eligible to win the award. 12 out of the 39 Ballons d'Or presented during this time period would have been awarded to South American players; in addition to Pelé and Diego Maradona, Garrincha, Mario Kempes, and Romário were retrospectively recognized as worthy winners. The original recipients, however, remain unchanged. Maradona and Pelé also received honorary Ballons d'Ors for their services to football in 1996 and 2013, respectively. ^ Born in Argentina, Di Stéfano acquired Spanish citizenship in 1956 and went on to play for the Spanish national football team. ^ Born in Argentina, Sívori acquired Italian citizenship in 1961 and went on to play for the Italian national football team. ^ Cruyff played for FC Barcelona from Ajax September 1973. ^ Keegan was signed by Hamburg from Liverpool midway through 1977. ^ Lineker was signed by Barcelona from Everton midway through 1986. ^ Gullit was signed by Milan from PSV Eindhoven midway through 1987. ^ Futre was signed by Atlético Madrid from Porto midway through 1987. ^ Rijkaard was signed by Milan from Real Zaragoza midway through 1988. ^ Ronaldo was signed by Internazionale from Barcelona midway through 1997. ^ Shevchenko was signed by Milan from Dynamo Kyiv midway through 1999. ^ Deco was signed by Barcelona from Porto midway through 2004. ^ Neymar was signed by Paris Saint-Germain from Barcelona midway through 2017. ^ Cristiano Ronaldo was signed by Juventus from Real Madrid midway through 2018. ^ Cristiano Ronaldo won two FIFA Ballons d'Or (2013, 2014) and thrice finished in second place (2011, 2012, 2015). ^ Messi won four FIFA Ballons d'Or (2010, 2011, 2012, 2015) and twice finished in second place (2013, 2014). ^ "Matthews wins first Golden Ball". BBC Sport. British Broadcasting Corporation. 1 December 2008. Retrieved 4 December 2008. ^ a b c "The 1990s Ballon d'Or winners". BBC Sport. British Broadcasting Corporation. 1 December 2008. Retrieved 4 December 2008. ^ "Kaka wins 2007 award". BBC Sport. British Broadcasting Corporation. 1 December 2008. Retrieved 4 December 2008. ^ "Ronaldo joins legendary list". BBC Sport. British Broadcasting Corporation. 1 December 2008. Retrieved 4 December 2008. ^ "Rankings by Wins". Rec.Sport.Soccer Statistics Foundation. 9 October 2008. Retrieved 4 December 2008. ^ "The FIFA Ballon d'Or is born". FIFA.com. Fédération Internationale de Football Association. 5 July 2010. Retrieved 4 December 2012. ^ "How the award came about". UEFA.com. Union of European Football Associations. 9 August 2011. Retrieved 6 November 2011. ^ "Kaka: Former Brazil, AC Milan and Real Madrid midfielder announces retirement". BBC. 17 December 2017. Retrieved 23 March 2018. ^ a b "La liste complête des lauréats du Ballon d'or, de 1956 à nos jours". France Football. Retrieved 14 January 2016. ^ a b "FIFA Awards – World Player of the Year". Rec.Sport.Soccer Statistics Foundation. 12 February 2015. Retrieved 14 January 2016. ^ "On this day, Di Stéfano won the Super Ballon d'Or". RealMadrid.com. 24 December 2015. Retrieved 13 January 2016. ^ Stokkermans, Karel (23 December 2015). "France Football's Football Player of the Century". Rec.Sport.Soccer Statistics Foundation. Archived from the original on 30 January 2010. Retrieved 13 January 2016. ^ Marchand, Thierry (December 2015). "On a refait le palmarès". France Football. Retrieved 13 January 2016. ^ "Maradona receives honorary award". BBC Sport. 1 December 2008. Retrieved 13 January 2016. ^ "Pele receives FIFA Ballon d'Or Prix d'Honneur". FIFA.com. 13 January 2014. Retrieved 14 January 2016. "European Footballer of the Year ("Ballon d'Or")". Rec.Sport.Soccer Statistics Foundation. 9 October 2008. Retrieved 5 December 2008. "La liste complête des lauréats du Ballon d'or, de 1956 à nos jours". France Football. Retrieved 24 March 2015.